USB-powered mic with two capsules and three operational modes: omnidirectional, cardioid, and cardioid with -10dB pad. The mic has built-in A-to-D converters, and outputs digital audio via the USB port at 44.1 kHz, 16 bits. The presence peak [of the Omni mode] is much higher than that of the cardioid modes. When the mic is used on-axis, the omni setting produces a nice airy sound which makes the cardioid modes sound slightly dull by comparison — almost like listening to a typical dynamic mic next to a capacitor mic. Blue intended the Snowball to be simple and easy to use, and it is. Like most of the other USB mics, the Snowball’s A/D converter has a 16-bit, 44.1 kHz resolution. However, the Snowball doesn’t give you the option of selecting a lower bit depth or sampling rate. A company spokesman noted that although there are newer USB chips offering a greater bit depth, it wouldn’t be of interest to the typical Snowball user: anyone wanting a higher resolution would use a regular mic with a dedicated converter. 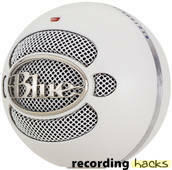 As of July, 2009, BLUE has sold over 300,000 of the Snowball microphone.